In a situation when the world is coming closer and the ideal of One Humanity, one nation is on its way to implementation, it is necessary and quit profitable to analyse the theories adumbrated by saints and scholars of different nations to find out how divers minds operated in diverse countries and tried to identify eternal truths for guidance of humanity, providing thereby a direction to all human exercise. In the present Monograph an attempt has been made to analyse the theories adumbrated by representative aesthets belonging to representative nations on important issues relating to creation and appreciation of Poetry. The Monograph proposes to project the idea that as the core content of all the principles of literary evaluation is the same, it is better to think in terms of Global Aesthetics rather than in terms of French Theory or Indian Theory, and Greek Doctrine or Indian Doctrine. Born on 1st January, 1928 in a family noted for its rich cultural tradition and scholarship in the District of Birbhum, West Bengal. Emerged as one of the outstanding alumnus of the University of Calcutta, and joined West Bengal Educational Service. 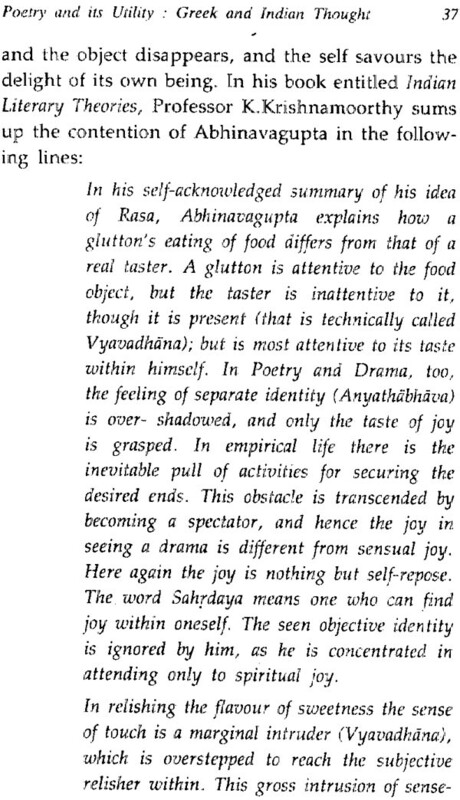 Was Professor and Head of the Department of Sanskrit, Jadavpur University, Caltutta and was the Vice-Chancellor of two Universities for Sixteen years. He adorned the office of the President of the Association of Indian Universities and the Chancellor of Tirupati Rastriya Sanskrit Vidyapeetha (Deemed University). A profound orator and versatile writer, a scholar receiving many awards, including the Certificate of Honour from the President of India and prizes and Honoris causa degrees and titles, including that of Mahamahopadhyaya. Ramaranjan Mukherji had the privilege of participating in many learned conferences in the country and abroad and leading a few Indian Cultural delegations. I have great pleasure to present this volume of Golden Jubilee of Independence Series of Rashtriya Sanskrit Sansthan to our esteemed readers. The Volume Verily represents the good will and cooperation, the Sansthan has all along been receiving from the distinguished scholars all over the country. The Sansthan was established in October, 1970as an sutonomous apex body under the Ministry of Human Resource Development, Govt. of India with a view to promoting, preserving and propagating Sanskrit learning in all its as pects, with special reference to the in –depth shastraic learnin. Apart from conducting the regular courses of studies at the constituent Vidyapeethas, it has been bnringing out invaluable publications representing dissemination of knowledge contained in the various Shastras. Thanks to the continued help, encouragement and support from the Ministry of Human Resource Development, Govt. of India that the Sansthan has grown in leaps and bounds and has been able to render its services to promotion of Sanskrit learning at national and international levels. Sansthan has decided to bring out 50 scholarly, monographs by eminent Sanskrit Scholars of different fields as part part of the academic programmes organised to celebrate the Golden Jubilee of india’s Independence. 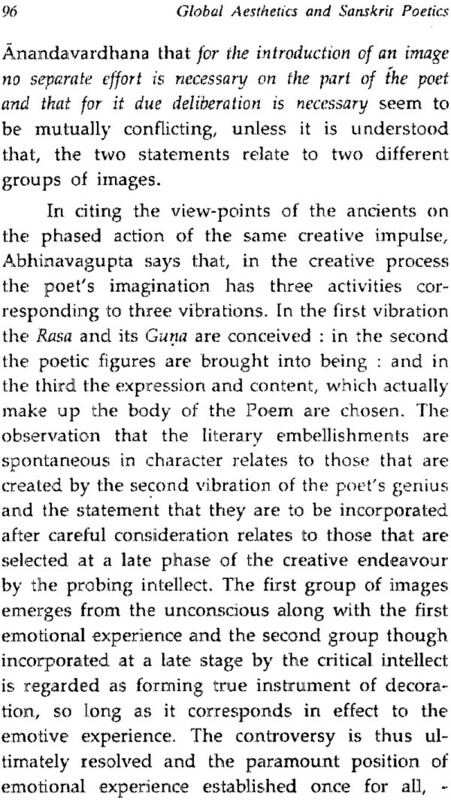 The present book GlobalAesthetics and Sanskrit Poetcs mades an attempt in its five chapters to analyse the aesthetic theories adumbrated by aesthets of east and west like Bharata, Anandavardhana, Kuntaka, Aristotle, Longinus, P.B. 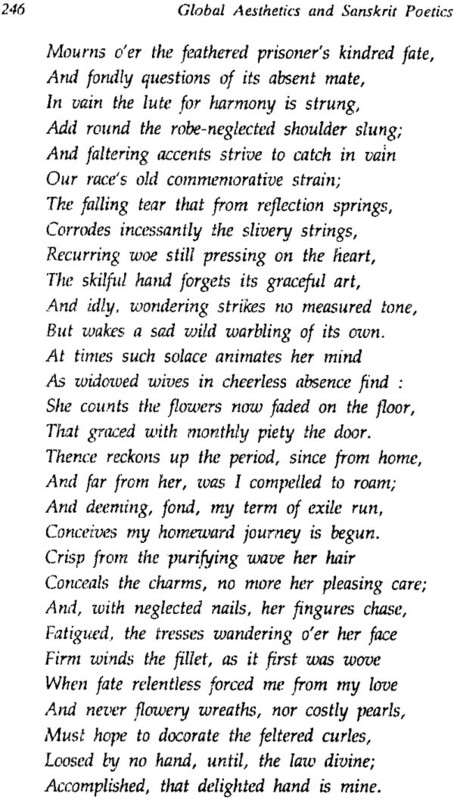 Shelley, Leigh Hunt, Stephen Mallarme etc. It identifies the areas of similarity and dissimilarity between various theories of aesthetics of different nations. The book would be of special use to those who are interested in the comparative study of the aesthetics. We are highly grateful to the learned author, scholar of international repute, recepient of President's Certificate of Honour, Professor Ramaranjan Mukherji, former Chancellor of Rashtriya Sanskrit Vidyapeetha, Tirupati (A.P.) for contribut- ing this scholarly book under the Golden Jubilee of India's Independence Series being published by Sansthan. The services rendered by my colleagues specially by Dr. Savita Pathak and Dr. Yiroopaksha V. Jaddipal deserve special appreciation who have been working day and night for planning and organising the various programmes connected with the Golden Jubilee Celebrations, particularly the publications of the Golden Jubilee Series. M/s Amar Printing Press deserve our thanks for bringing out this monograph on time. Thanks to scientific discoveries and technologi- cal advancements the world is coming closer and the ideal of one humanity one nation is on its way implementation, The projection made by ancient Idian seers in the dawn of human civilisation in regard to the solidarity of the universe is going to be reaffirmed and placed on a solid foundation by science and technology. The truths arrived at by the seers through experience is going to be re-established once again through scientific methods of investigation by modern science and technology. In the present era natural sciences are combining with the Science of Man in depth to establish eternal truths, that have been visualised by great minds of all nations. In such a situation it is necessary and quite profitable to analyse the theories adumbrated by saints and scholars of different nations to find out how diverse minds operated in diverse countries and tried to identify eternal truths for guidance of humanity, providing thereby a direction to all human exercises. 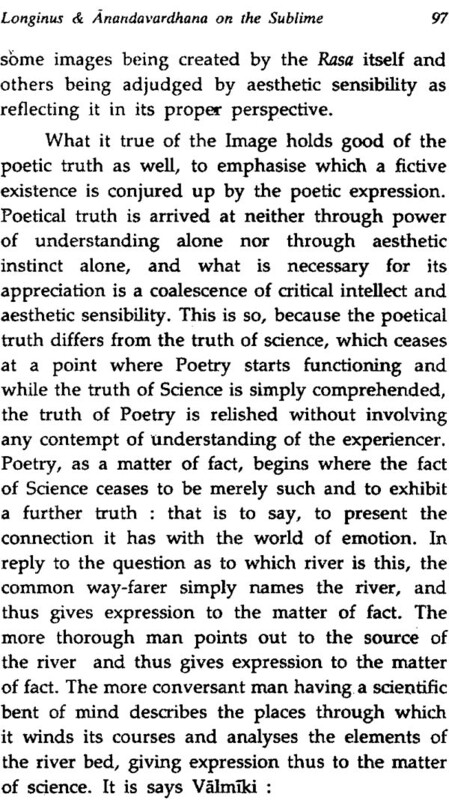 In the present monograph an attempt has, been made to analyse the theories adumbrated by representative aesthes belonging to representative nations on important issues relating to creation and appreciation of poetry. 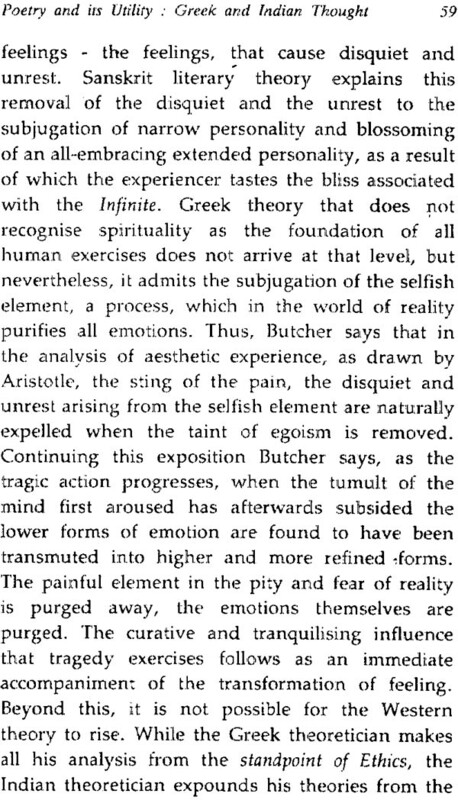 It is astounding that this analysis has established once again the truth that the same problem in the field of aesthetics haunted the minds of all nations, literary artists and critics belonging to each of which tried to solve these by judging them from different angles, but winding their paths through different lanes and by-lanes ultimately arrived at the same point. 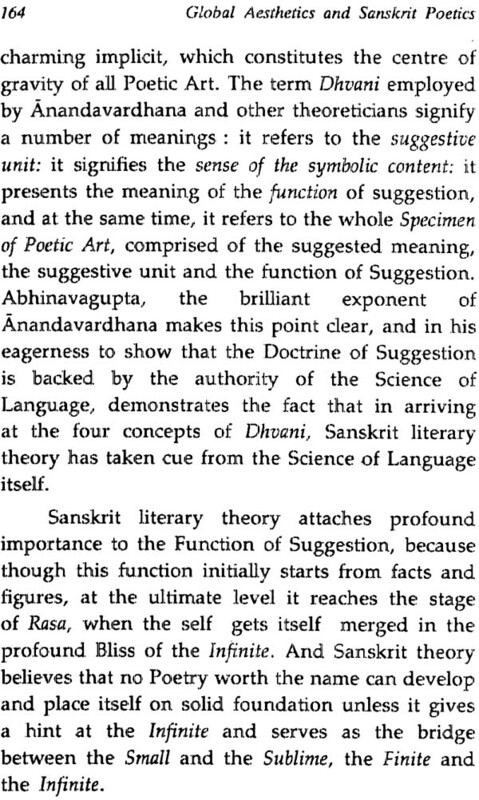 It is surprising that attainment of supramun- dane delight has been regarded as the end of poetic pursuit by all nations and that the function of suggestion has been regarded as the most impor- tant function, which, when triggered into action, opens the gate of the empire of the Symbolic. 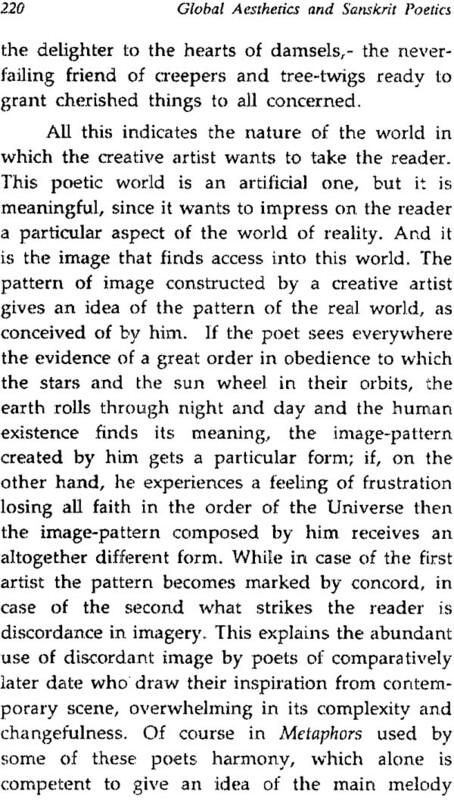 It is equally amazing that the same qualities of the successful poetic paintings are emphasised by all literary theoreticians, irrespective of the fact that they belong to the Occident or Orient. 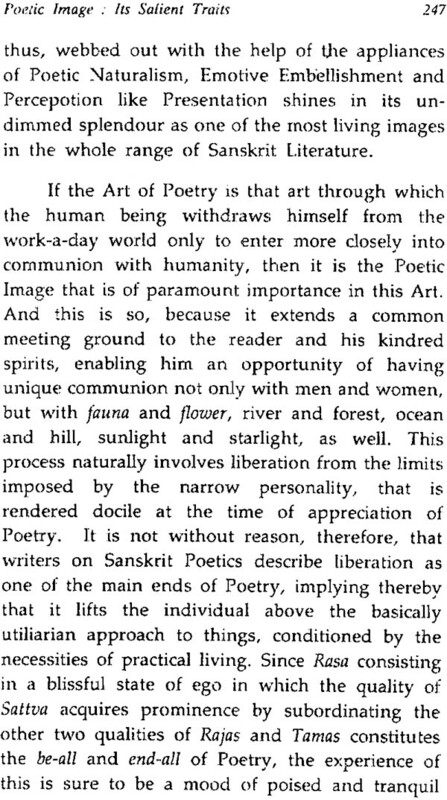 Though generally Western Poetry is analysed by applying the principles of literary evaluation formulated by the West and Indian poetry is analysed by applying the yardsticks presented by Indian theoreticians, a cogent analysis of all the theories reveals that while Indian poetry is capable of being analysed by applying Western yardsticks of judgement, the western poetry also is capable of being evaluated by applying Indian yardsticks, and this is so because the core content of all the principles of literary evaluation is one and the same, the only deffernce being in nomenclature and degree of assessment. 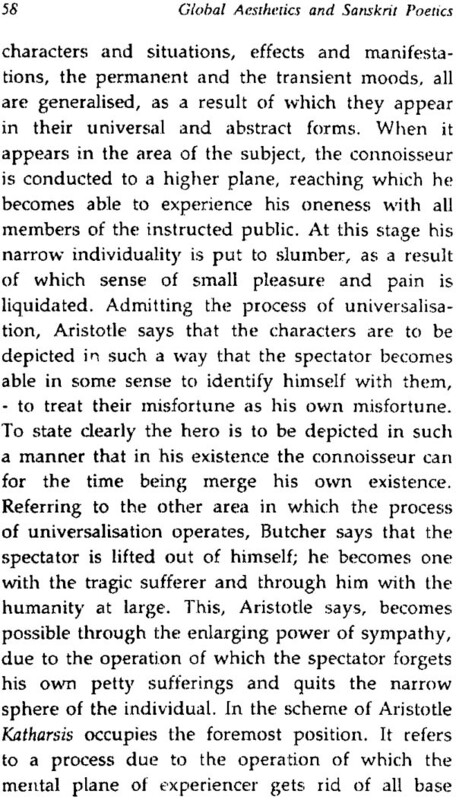 All this shows that in a situation when all the nations are attempting to establish unity among themselves as also to translate into action the ideal of one humanity, one nation, the concept of Global Aesthetics is to be floated to the exclusion of such fragmented concepts, as Indian Aesthetics or Western Aesthetics, Indian doctrine of Suggestions or French theory of Symbolisation, Aristotle’s doctrine of Katharsis or Abhinavagupta’s principle of universalisation (Sdharanikarana). 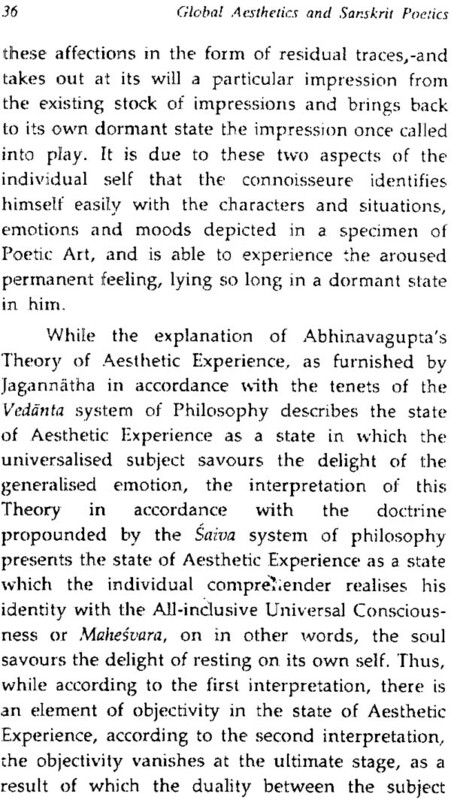 In the Monograph a modest attempt has, therefore, been made to present the general theories of Globel Aesthetics by assimilating and syuntheseseing diverse concepts floated or projected by aesthets of different nations. The Monograph is divided into five chapters. 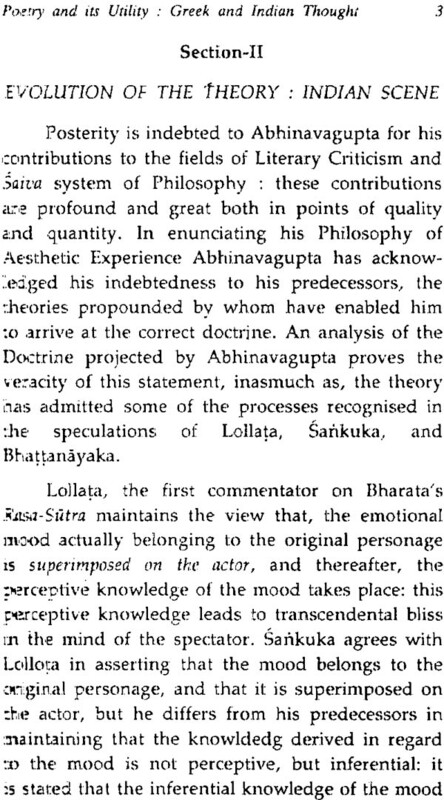 The first chapter presents an analysis of the doctrine of Bharata and Aristotle, and shows how the commentators of Bharata and those of Aristotle have conducted their discussions and projections on the same line. 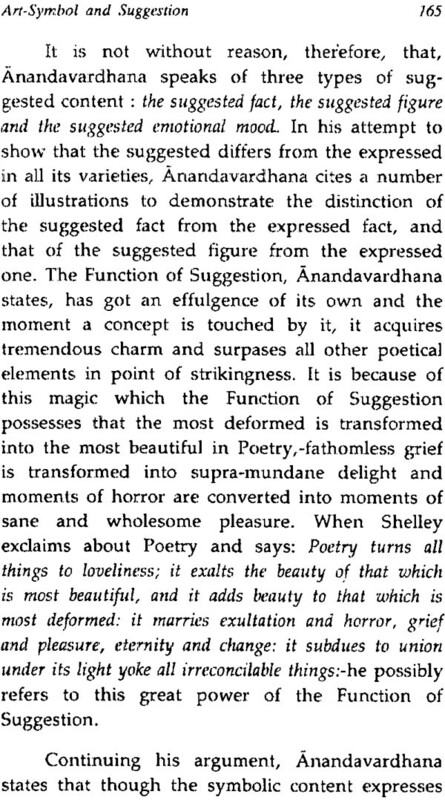 The second gives a detailed analysis of the viewpoints of Longinus and Anandavardhana, both of whom consider the doctrine of Suggestion as of profound importance and float the Gestalt theory of poetry, affirming that, poetry is an organic whole and as such is incapable of being fragmented into parts. While the first two chapters deal with the viewpoints of the Greek theoreticians, the third chapter presents the theories adumbrated by British theoreticians like P.B. Shel1ey, Leigh Hunt, John Stuart Mill and T.S. 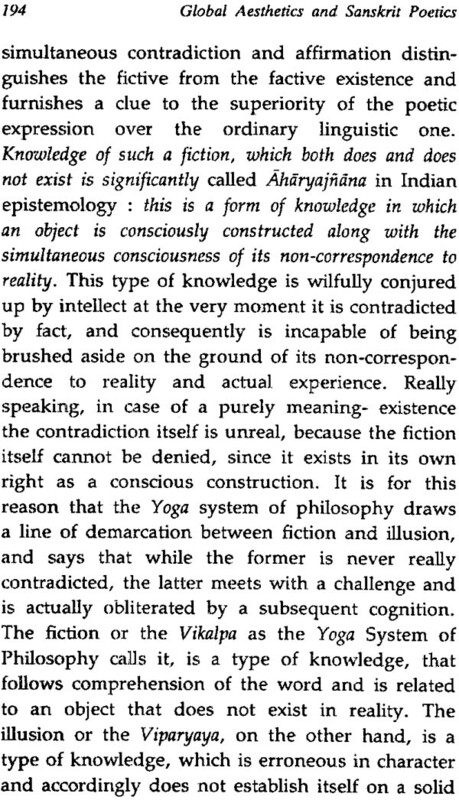 Eliot, and proceeds to show how these theories are similar to those projected by Indian theoreticians. 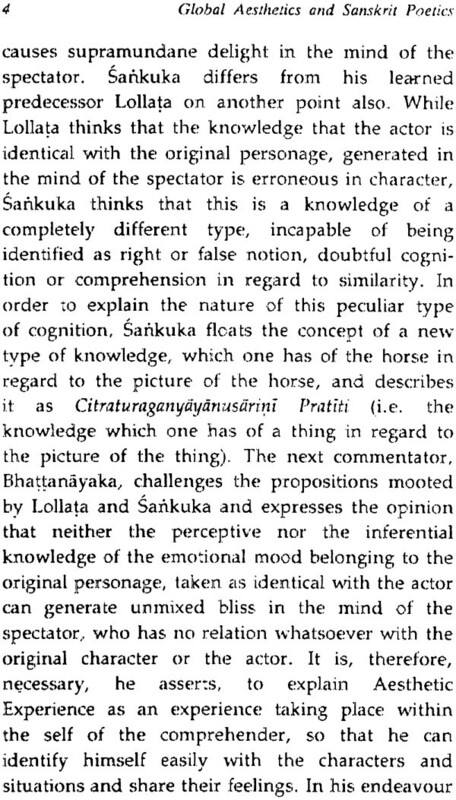 As a matter of fact, some of the observations made by propounders of English Critical theories appear like foot-notes to such monumental works as the Dhvanyaloka and the Vakroktijivita. 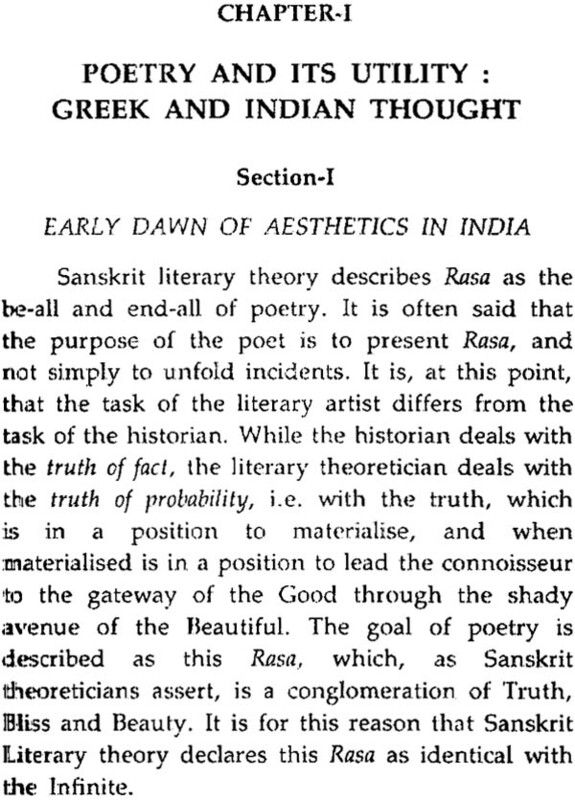 The fourth chapter treates the views of French Symbolists like Stephen Mallarme and Paul Valery and shows in what respect the theories of French Symbolists are in agreement with Indian Dhvani theory, indicating at the same time the difference between the two. 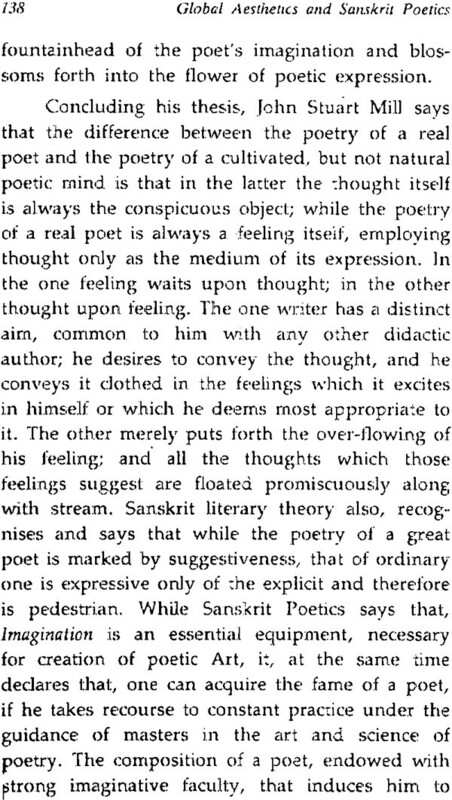 The poetic image comes out for discussion in the last chapter, which starts by projecting the Indian theory of meaning, according to which meanings are ideational in character along with their cor- responding expressive words, as a result of which it has been possible to declare the absolute identity of the the word and the meaning. 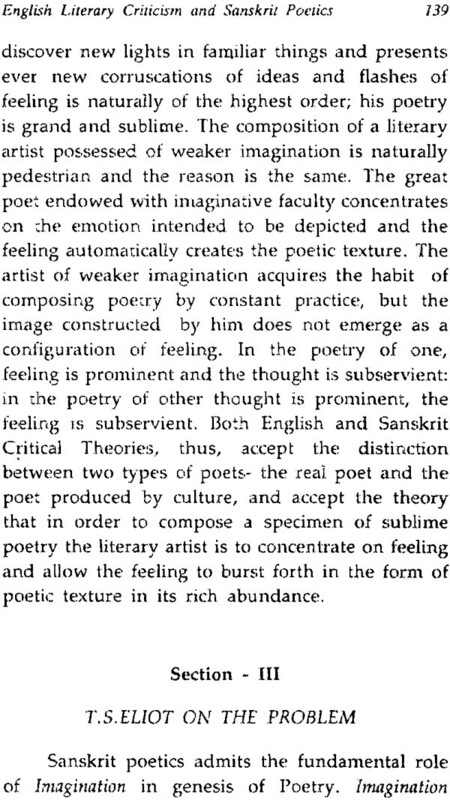 Though Western literary theory considers the poetic image as the main-stay of the poetic structure, Indian theory does not attach that importance to the poetic painting; but, at the same time, it puts sufficient premium on the literary embellishment, the presence of which is regarded as an essentiality in the texture of poetry. 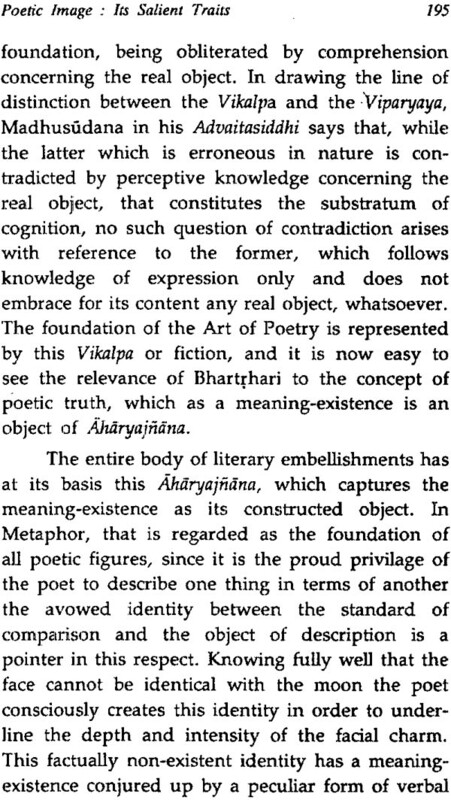 As a matter of fact, the science of literary criticism is given the designation of Alankarasastra, indicating thereby the significant role played by the literary embellishment in the structure of poetic art. 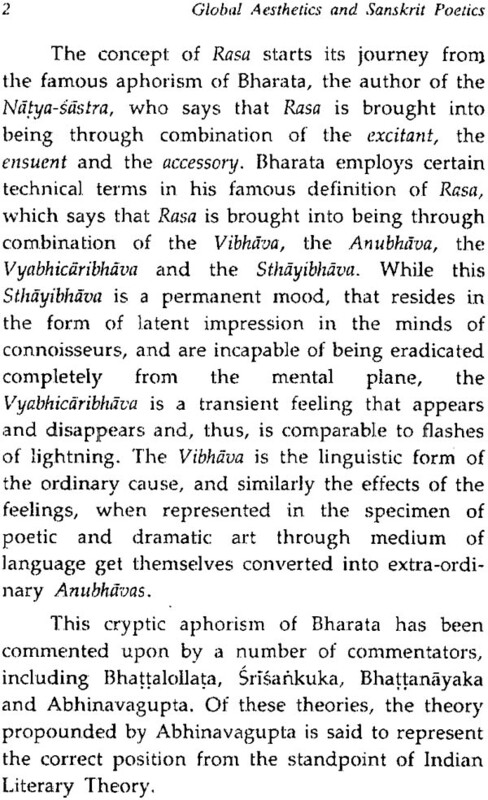 Western theoreticians refer to certain qualities of the poetic image; Indian theoreticians consider the necessity of these qualities, but they comprehend these under the extended canopy of certain well-known concepts like Propriety, Suggestiveness and the process of Universalisation, that idealise the characters and situations, moods and conditions. 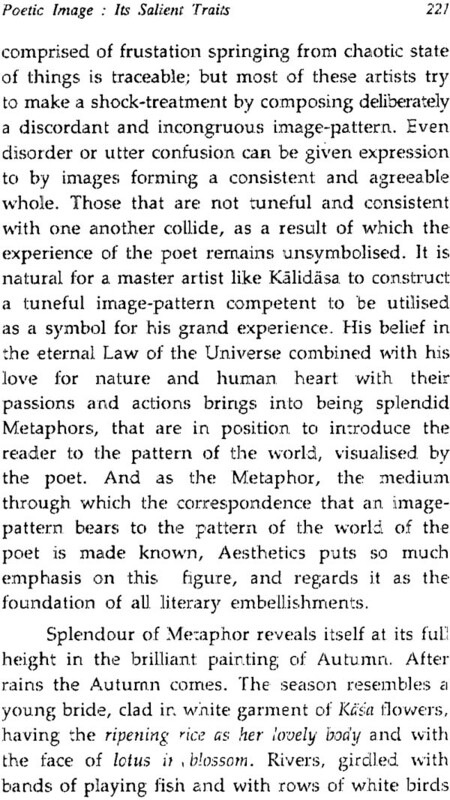 In the last section of this chapter significant illustrations of certain successful poetical paintings are given, along with an analysis of these, indicating the reasons for their excellence.